Joseph was the second youngest son of Jacob through his wife Rachel whom he loved. He was favored by his father who gave him a special tunic of many colors. His brothers were jealous of him. At seventeen, Joseph was feeding the flock with his brothers and he had two dreams which caused his brothers to hate him even more. These were not directional dreams; they were a foretelling of future events. Joseph’s eleven brothers caught the significance at once and when his father Jacob heard the second dream he also fully understood the meaning. The time would come when these things happened. Joseph would rise to a position of second in command under the Pharaoh in Egypt. His brothers and indeed even his father would submit to his authority and they did bow down to him. Joseph had a special gift of dream interpretation and that would serve him well after he was sold into slavery in Egypt by his brothers. However, as a seventeen year old, he did not yet have a very well developed sense of wisdom. He should have kept these dreams to himself and quietly watched to see what God would do. 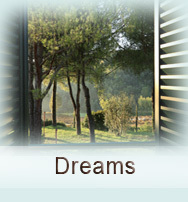 Having a prophetic dream does not mean we have to publicly proclaim it. This is a big mistake that some prophetic people make. Sometimes God gives us information that he just wants us to set on a shelf. He watches to see if we are trustworthy with the information he gives us. Joseph eventually grew to great maturity but he did so through great suffering.